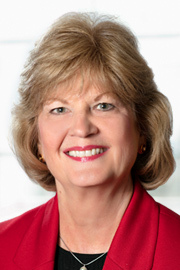 Scarlott Mueller, MPH, RN, FAAN, has volunteered with the American Cancer Society for over 35 years and has held leadership positions at every level of the organization, including service as Board president/chair of the former Florida Division and chair of the American Cancer Society, Inc. Board of Directors. Ms. Mueller’s community and volunteer roles stretch far outside of the Society. She has served on the boards of other organizations, including the Oncology Nursing Society Foundation, Samaritan Counseling Center of North Central Florida, the Oncology Nursing Certification Corporation and the Oncology Nursing Society-Nominating Committee. She currently serves on the Board of the International Society of Nurses in Cancer Care. Ms. Mueller retired after serving 21 years as the vice president and chief nursing officer for the North Florida Regional Medical Center. She had management and quality of care responsibilities for the areas of nursing, pharmacy, rehab, respiratory, regulatory and emergency services. She oversaw the first and ongoing successful achievement of the facility's comprehensive community cancer program accreditation as designated by the ACOS Commission on Cancer. Throughout her professional career, Ms. Mueller received a number of awards for her commitment to her patients and her career, including being inducted into Sigma Theta Tau, the international honor society for nursing in 1977, being recognized as the 1988 Woman of Achievement in Durham, NC, winning the Society’s St. George National Award in 2010, receiving the former Florida Division’s Distinguished Service Award in 2013, being inducted as a Fellow in the American Academy of Nursing in 2018, and being elected as an Honorary Life Member of the American Cancer Society, Inc. Board. Ms. Mueller received a master’s degree in public health from the University of North Carolina at Chapel Hill in 1985 and a bachelor of science in nursing degree from the University of North Carolina at Chapel Hill in 1977.